Lanzarote is one of Spain’s most dreamy Canary Islands off the coast of West Africa. With stunning beaches and a majestic volcanic landscape , it has become one of the most popular destinations for couples tying the knot. So, if you’ve decided to get married here, then we have the perfect hotel and venue option for you. Many couples are put off destination weddings as they seem to think it would be more stressful to organise a wedding abroad than one at home. But, with a hotel package deal and some savvy wedding planners, your whole day will be organised for you, so all you need to do is turn up! 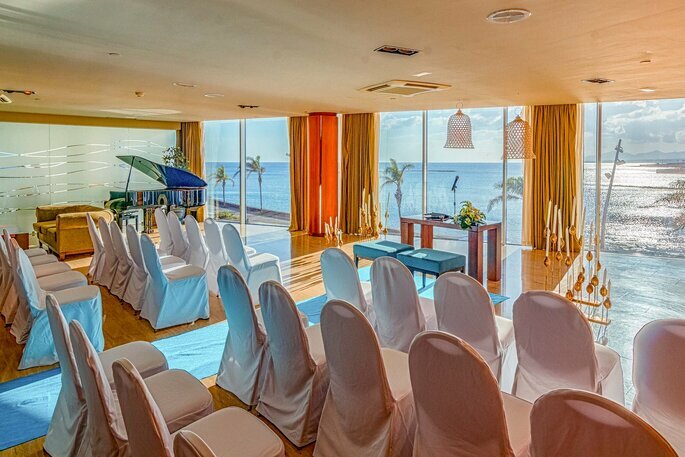 Arrecife Gran Hotel & Spa will satisfy your destination wedding dreams – that’s for sure. 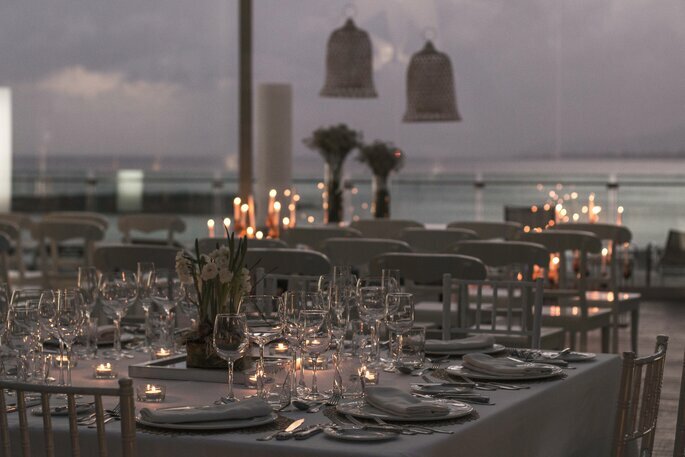 Situated in front of the picturesque El Reducto beach, you really won’t be able to find a more romantic setting for your special day. 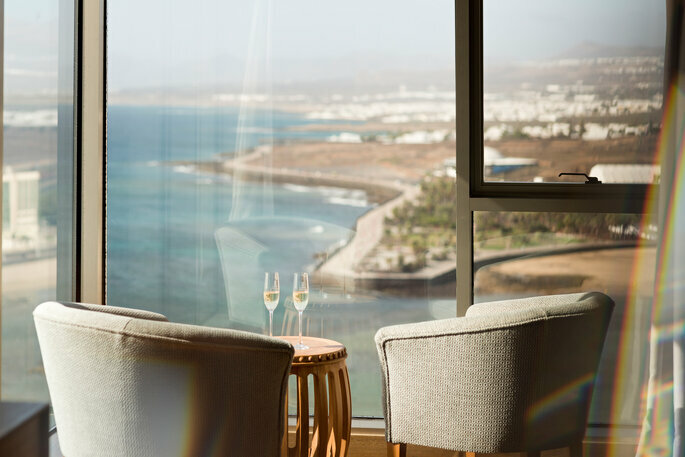 Standing tall in Lanzarote’s capital of Arrecife, the Gran Hotel has a more urban and sophisticated feel compared to the surrounding resorts, and it’s the only skyscraper in Lanzarote with incredible views, a city glamour feel, as well as a beach on its doorstep! 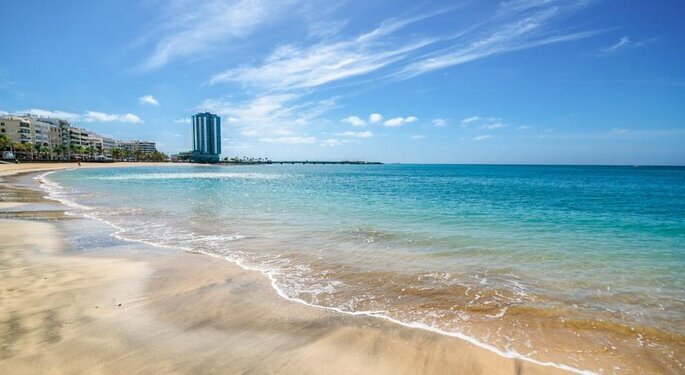 A walk along the beach will take you to bars, restaurants and shops, or you can choose to chill out in the hotel’s tranquil areas. 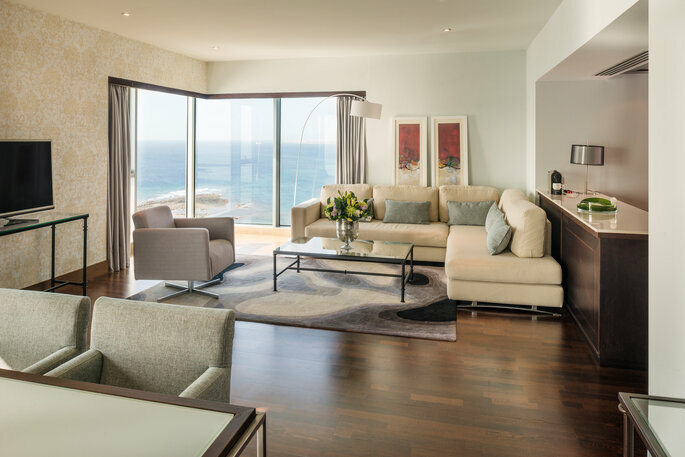 With comfort and luxury comes impeccable service as this 5* hotel is undoubtedly the best on the island. 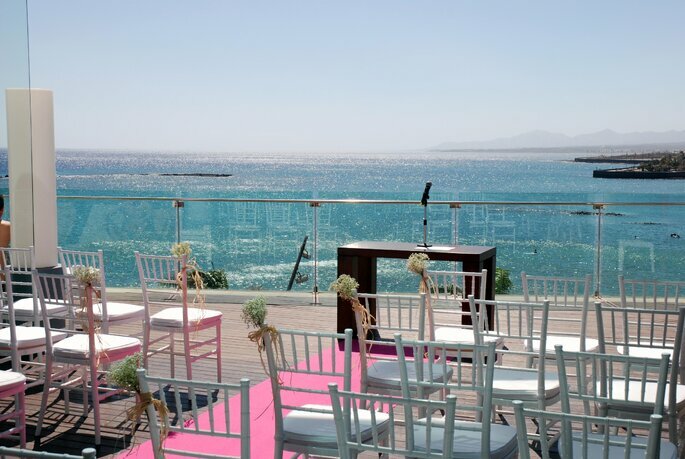 When getting married at Gran Hotel, you will be spoilt for choice with their available event spaces, from sea view terraces, to numerous restaurants, or even the pool bar which has an impressive glass roof. In these pictures you can see for yourself: this hotel has some seriously talented event planners that make for some spectacular wedding set ups. 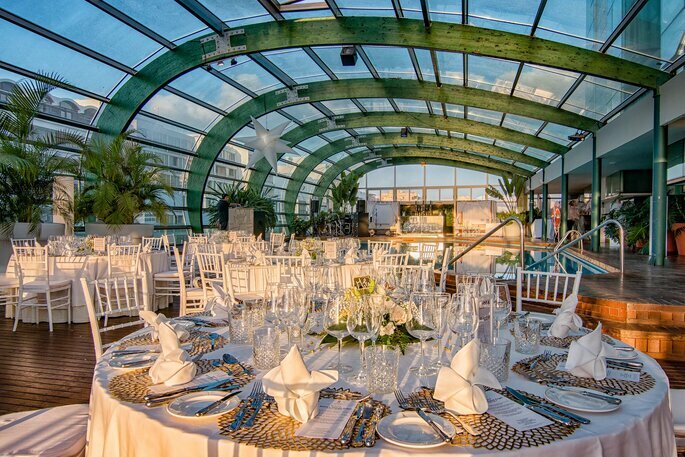 So whether you want alfresco dining, a beach ceremony or the city glamour of a glass restaurant, Gran Hotel has it all. 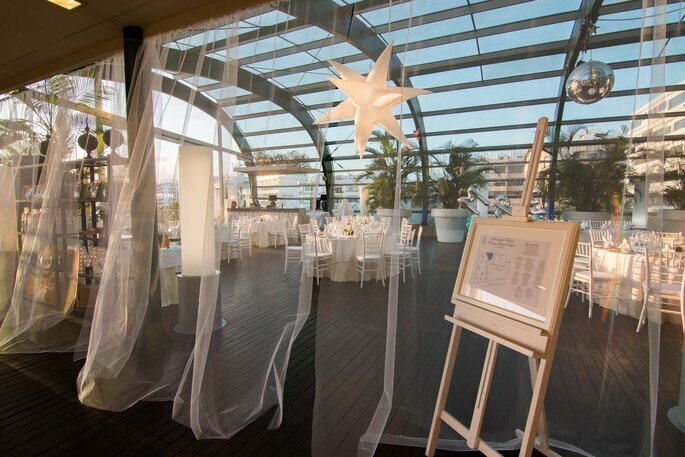 One of our favourite event spaces that Gran Hotel has to offer, is the Altamar Restaurant on the 17th floor. It’s popular among guests and locals alike for its traditional cuisine, and the views are unparalleled. 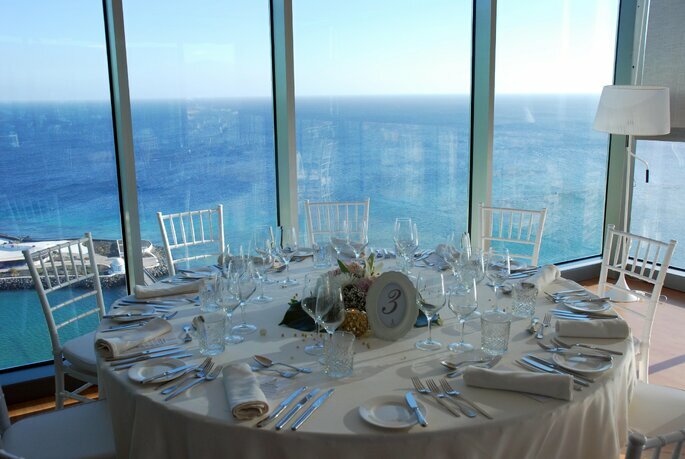 You’ll have an unforgettable gourmet dining experience whilst celebrating with your loved ones high above the island. Not persuaded yet? 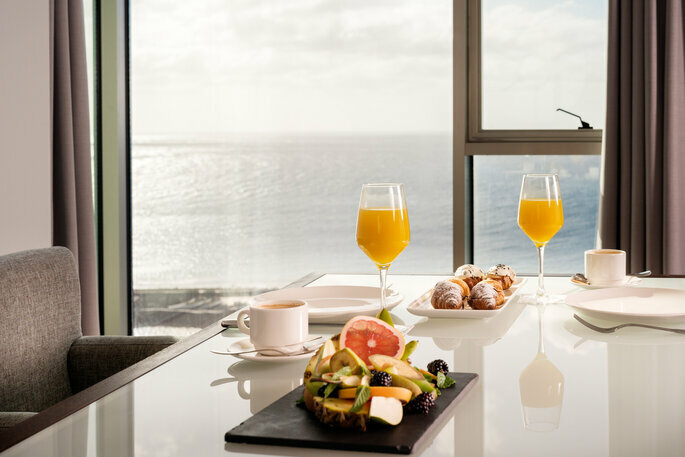 Well just imagine the accommodation… Arrecife Gran Hotel has 26 city-view rooms, 26 sea-view rooms, 104 suites facing the Atlantic ocean and beaches, as well as four Imperial Suites for a really luxurious and romantic stay. Your package with Gran Hotel will include a couples suite for your wedding night (with a gift and breakfast included), as well as discounted rooms for all of your important guests. Which means you can enjoy time alone with your fiancé as well as an amazing experience abroad with friends and family. What’s not to love? 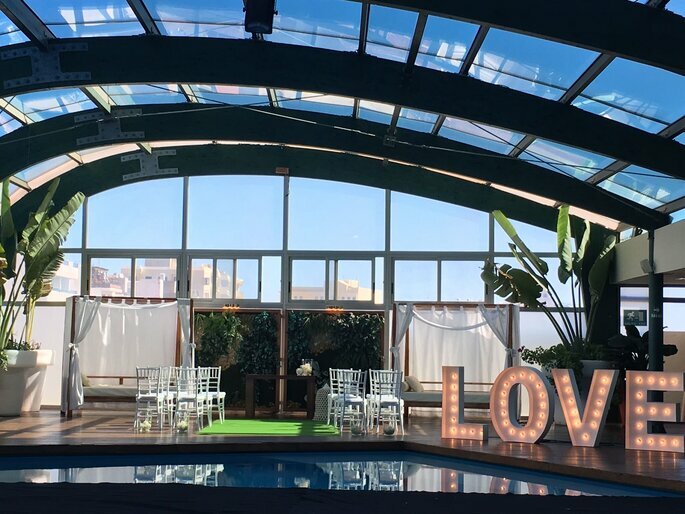 As well as accommodation deals, the Gran Hotel wedding package includes decorations, the setting up of the ceremony, and even the wedding cake. Plus, don’t worry about those guests with special diets, they will prepare menus for everyone and even let the bride and groom enjoy a session in the spa! 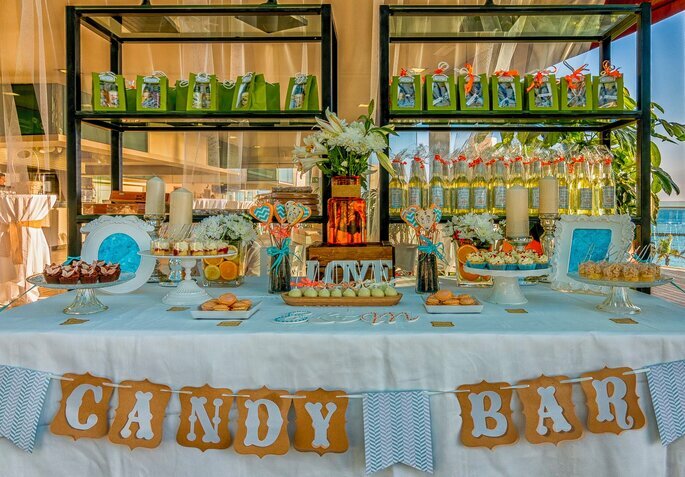 Their events organisers are professional and make sure they meet every couple’s wedding desires. So what are you waiting for? 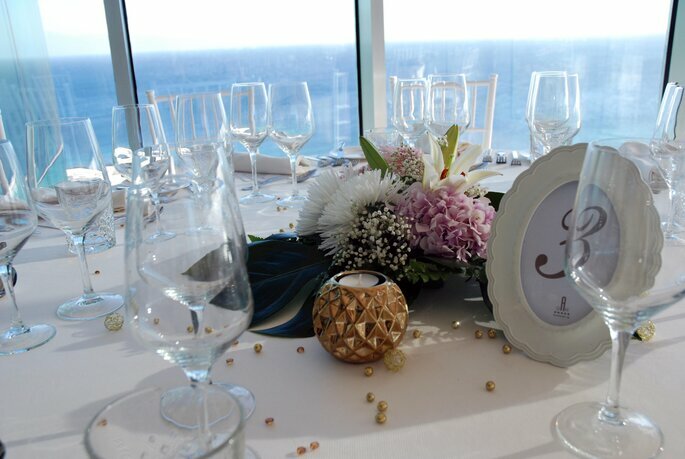 You’ll not regret holding your wedding in the beautiful Arrecife Gran Hotel, you’ll have not only a magical ceremony but also a relaxing holiday experience with your loved ones to remember forever. Plus, you can be sure to escape the bleak British weather with the island’s year-round sunshine. To kickstart the planning, head over to the hotel’s wedding page and get the conversation started with their expert team. We at Zankyou have no doubt it’ll be the best day of your life!